Councillors in a Berkshire borough fear plans to improve a neighbouring town could damage trade in their area. 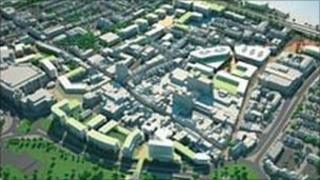 Wokingham Borough Council says plans to improve Maidenhead could cost its area more than £11m in lost business. The councillors claim proposals for Maidenhead are too big and could lead shoppers to desert Wokingham and Woodley town centres. Windsor and Maidenhead's council said it was working with Wokingham to address the concerns. Wokingham's planning councillor Angus Ross said: "What we are concerned about is the sheer size of the retail increase that they are proposing. "What we are trying to do is not disturb the hierarchy of the various towns and disturb that balance that exists today so each town can become successful as the economy improves." Councillor Alison Knight, lead member for planning and development at the Royal Borough of Windsor and Maidenhead, said: "We understand that Wokingham Borough Council does have some concerns about the Maidenhead Area Action Plan and we are currently working with them to clarify and address those concerns. "But our priority has to be to safeguard the interests of our own residents and our towns and ultimately we have to do what we consider is best for our borough."